I’m just gonna say it: I love iced coffee. The love affair began in college. I treasure memories running out of stats class in order to move my car close to my philosophy classroom building so that I could take friends to Dunkin’ Donuts after lecture but before the next class would begin (read: we had a ten minute time frame). We had the mini-trip down to a SCIENCE. Usually my friend Lisa and I would go, taking with a “new friend” or two to get in on the fun. Other times, I would walk to Dunkin with students I mentored or my roommate Allison. One time, a complete stranger bought a round for me and a group of friends! (Shout out wherever you are, Tommy Bahama Shirt Man!) Keep in mind Dunkin only charges $1. But still! Another time Lisa and I got “yelled at” in the drive through for ordering too many iced coffees in the drive through (“If you’re going to order THAT MANY you really need to come inside!” -Noted). The iced coffee appreciation has continued past college, though. My absolute favorite iced coffee comes from Starbucks. I go through phases of how exactly my iced coffee is ordered (sometimes with soy and no sweetner, other times with coconut milk and 2 pumps sweetner, and if I want to go BIG it’s with light cream and 2 pumps of toffee nut). Being the open-minded girl I try to be, I’m always down to try other versions of iced coffee other than Dunkin and Starbz. I will admit my recent trip to McDonalds did not yield the best results (#BUT4REAL how do you get “extra cream” out of “with just a teeny tiny bit of cream please”). Lots of people drink soda as an afternoon pick-me-up at work. I like iced coffee as my beverage to eagerly await after 1pm rolls around. 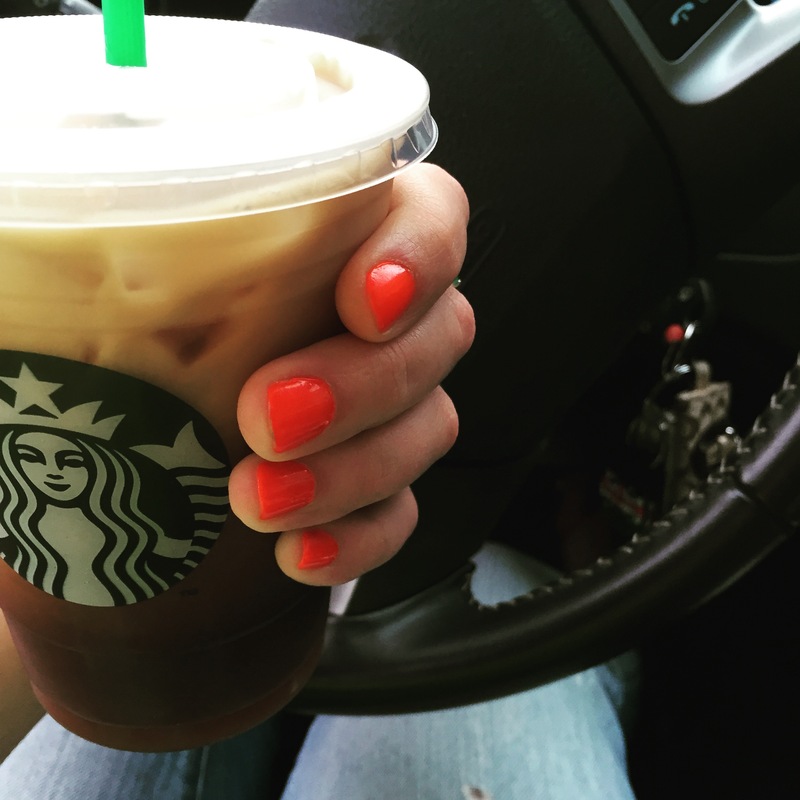 Iced coffee also tastes great in my car, with my sparkle sleeve and when my nails are painted ESSIE Saturday Night Disco. Just sayin’. I’ve been spending a whole lot of freetime with my friends who, like me, are going to mentor transfer students this semester. 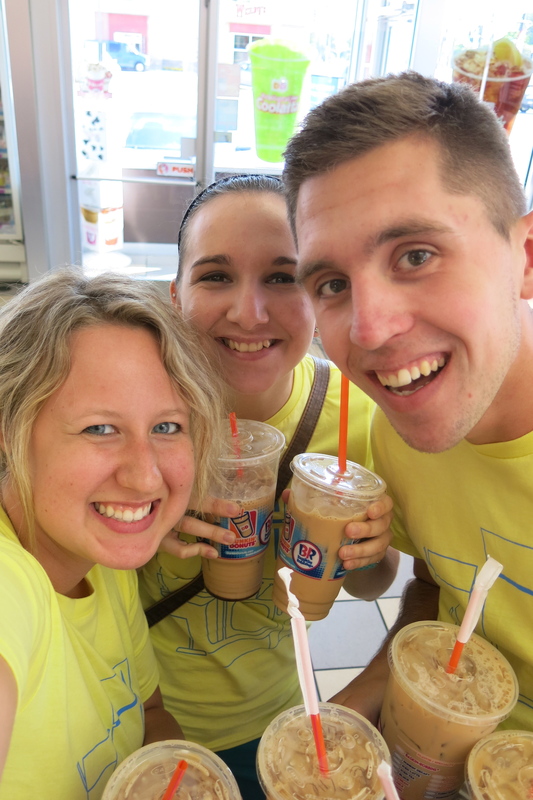 Because the students don’t come until tomorrow, we’ve had time for fun outings such as Dunkin Donuts runs. We brought most of these iced coffees back to friends. To clarify, we each only had one. I promise!